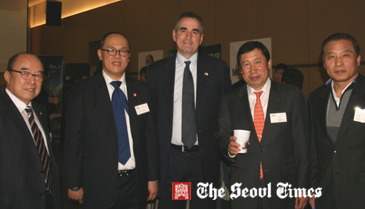 Minister-Counsellor Michael Danagher (center) of the Canadian Embassy in Seoul, poses with SBS Adviser Lee Sun-Myung (to his right), President Park Chul (right) of KAPA Co., and President Jun-Heon (Andy) Lee of Big Rock Brewery Korea at "the Canadian Beer and Cider Tasting" event held at the Seoul Palace Hotel on March 13 (Wednesday), 2013. "Canada's High-quality malt and other raw ingredients, and lots of clean Canadian water" are the key to the popularity of the Canadian beer," explained Minister-Counsellor Michael Danagher of the Canadian Embassy in Seoul at the event of Canadian beer tasting held in Seoul on March 13, 2013. "Canadian beer is very popular throughout the United States and is exported to different markets around the world," added Mr. Danagher, who is the deputy head of Canadian mission in Seoul. Mr. Danagher organized "the Canadian Beer and Cider Tasting" event held at the Seoul Palace Hotel on March 13 (Wednesday), 2013. The first-ever Canadian beer tasting event hosted by the Canadian Embassy in Seoul drew a large number of lovers of the Canadian beer: Scores of local importers of the Canadian beer, restaurant owners, and local journalists. A total of seven Canadian beer — Moosehead, Big Rock, Alley Kat, Molson Beer, Mill St Beer, Whistler Beer, and MOJO — were introduced to the event. "We want to use this occasion to introduce new Canadian beers to the Korean market," Mr. Danagher said. "We want to widen the knowledge of the Canadian beers already in the (Korean) market" Mr. Danagher is the senior trade commissioner of the Canadian Embassy in Seoul. "The Korean beer market is rapidly changing, and we are excited by the opportunity to give Korean beer drinkers some very good choices," he explained about the purpose of the event. "We hope that we will see some new Canadian beer companies enter the (Korean) market," he said. "We have seen a real growth in sophistication of beer products in the past decade or so, including greater interest in matching beers with food"
According to the Canadian diplomat, beer is very flexible in terms of the range of food types it can be matched with. "There is a good variety of beers in Canada, and Canadians are used to eating a wide variety of cuisines from around the world, he added. "So many of the beers we are introducing match well both with Korean and wider international cuisine." "Or they can be enjoyed on their own," he advised the local Korean beer drinkers. Mr. Danagher, who is an excellent speaker of the Korean langauge, has spent a total of eight years in Seoul as a diplomat. 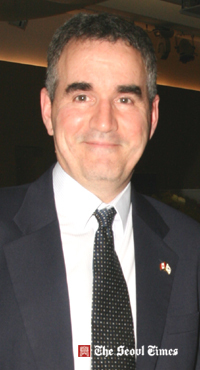 The period includes the previous four years he served at the Canadian Embassy in Seoul in 1990s. He gave a long and detailed explanation about the characterictics of the Canadian beer. Mr. Danagher said that Canada is a relatively new country, but it has a long history of beer drinking, through her European connections. Molson was founded in Montreal in 1786, and is the oldest brewery in North America. This puts Molson in the same heritage as Guinness (1759) or Bass (1777). Not quite as old, but still with long histories, are Canadian breweries such as Alexander Keith's (1820), Sleeman (1834), Labatt (1847) and Moosehead (1867). So a lot of traditional beer craftsmanship remains. "But Canadian drinkers are also open to new ways of presenting beer, and to new flavours," he said. Canadian beer products are made by micro-breweries such as Big Rock, Alley Kat, Mill Street, and Whistler. "On top of that, Canada is a major producer of agricultural products," he added. "So the raw ingredients, such as malt, are high quality. And, yes, lot of clean Canadian water, too"
He went on to say that there is no typical Canadian beer but some regional variations. India Pale Ale is popular in eastern Canada, ales predominate in Quebec, while Pilsner-style lagers are popular in Ontario, particularly near the city of Kitchener, a traditional destination of German immigration and the site of Canada's most popular Oktoberfest. Ice beers and bocks are popular in Canada, as are cream ales, according to Mr. Danagher. For oldtimers Canadian beer was packaged in short-necked bottles called "stubbies," which disappeared in the mid-1980s, when Canadian breweries started standardizing long-necked bottles in order to better integrate with the American market. "Canadian beer is very popular throughout the United States," he added.